A day like any other, 07 January 2015, and suddenly a massacre with machine guns. Two masked gunmen forced their way into the offices of the French satirical weekly newspaper Charlie Hebdo in Paris, France, and killed twelve people. Frédéric, the first one killed, just happened to be walking into the offices of Charlie Hebdo to make repairs inside the building. He and his colleague were not even aware of the newspaper. His colleague dragged him into the restroom to protect him and care for him until help came, but Frédéric died in his arms. 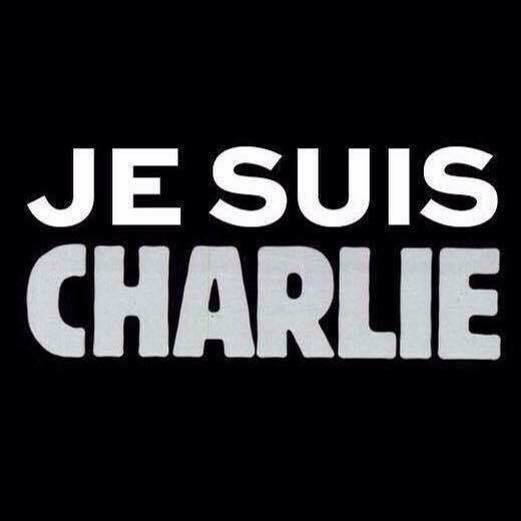 As people became aware of the murders of the staff at Charlie Hebdo by Islamic terrorists, France created the hashtag #JeSuisCharlie = "I am Charlie" to represent all the slain cartoonists and the right of free speech. The world responded. Twitter boards lit up with the most tweeted hashtag in its history. You can see the use of #JeSuisCharlie on Twitter by geographic location in this depiction. Along with the murder of the staff at Charlie Hebdo, people were also killed in a Jewish grocery store. More innocent deaths took place in the Parisian area, a total of 17 in all. The initial attack was directed at the newspaper, Charlie Hebdo, known for its satire and irreverant religious and political cartoons. Lest you think Muslims were singled out in particular, they actually focussed a lot on general politics and Catholicism and Judaism were not spared either. Albert Uderzo is the creator of Astérix and Obelix, a much loved French comics depicting the escapades of a group of Gauls under Roman occupation. Uderzo retired in 2011. Uderzo stepped out of retirement to express his solidarity as a cartoonist as well as his sorrow and anger at the recent events. His drawing is in character with his irascible character, Astérix. A Paris march to honor the victims of terrorism took place on 11 January 2015. It was an historical event for France, and for the world. People took to the streets to show their solidarity for freedom of speech and to stand against terrorism. People held gatherings and walks in other parts of the world as well. Heads of State from around the world joined the President of France for the event. It was remarkable for all of them join each other and walk down the street together. A record number of people took to the streets to show their solidarity. At least 3.3 million people came out, the greatest number since the liberation of France in WWII. World Events – What Does It Mean To You? This is not a political blog by any means. We are here to celebrate The Radiance Technique®, and naturally part of that celebration is how we use TRT® in our lives. Our lives include all the personal details of our individual days; it also includes world events swirling around us. Some events touch us directly, others we watch as a witness. In terms of energy, there is nothing that doesn't touch all of us. We are all connected at the deepest inner point. We truly are connected to everything. For students of The Radiance Technique® (TRT®) who have studied The Second Degree of TRT® (and above), it is possible to direct universal energy to world events as well as the details within them. For example, you could direct energy to the events of the murders. You could take time to direct to each person who was killed (refer to the photo above). This could be done over a period of time, even weeks. You could also include their family and friends grieving for them. You could direct energy to the entire crowd of people at the rally. You could direct energy to peace prevailing and terrorist acts failing. You can direct to whatever speaks to your heart, even if it is to the people who committed these vicious acts. When you direct energy, it does not change the world events. The past remains the past as a fixed point in time. But, you do offer supportive, healing energy to all involved, in ways you won't know with your mind. Universal energy will be there for them to heal deep within, as they see fit at the inner-most levels of their being. You offer this energy freely, without knowing an outcome. It is not cause and effect. For students of The First Degree of TRT®, you can work with your TRT® hands-on in your meditations. Maybe these world events make you sad, maybe you feel immense anger, and then sad again. These are normal human emotions as a reaction to violent circumstances. You can bring balance and healing to yourself with the use of TRT®. Be sure to use your Radiant Touch®, your TRT® hands-on, in the moment, when you are having these feelings. You can also combine your TRT® hands-on with a specific meditation.